110% enhanced and redesigned - the much-loved Warm Up Cards and completely new: 8 complete Warm Up programs. Everything in a new and functional layout with over 600 photos for an unbeatable low price. And the best - you can print as many as you want and need. The Warm Up Cards (5 DINA4 - Pages delivered as PDF-File) and the Warm Up Programs (8 DINA4 - Pages delivered as PDF-File) can be downloaded for a price of just 14,99 EUR for the whole package. Price: 14,90 USD (including German VAT, pay via Paypal, delivered as PDF-file via download) - click „add-to-card“ and follow further instructions. The Warm Up Cards containing five pages (delivered as PDF-Document) that can be loaded to your devices or be printed infinite times to put in your pocket. 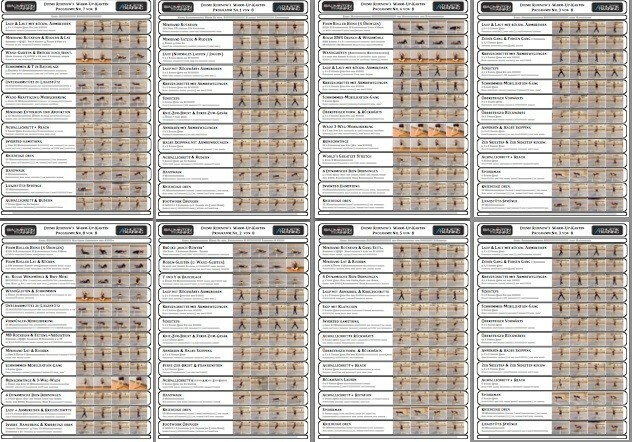 They contain 66 different exercises with more than 200 photos and a short description each. Optimal for the coaches’ use to put together an own functional warm up program - for a perfect Badminton warm up. The Warm Up Programs containing eight pages (delivered as PDF-Document) that can be loaded to your devices or be printed infinite times to put in your pocket. Every single program contains years of coaching’ experience from different levels - recreational, club, youth and even national players and Olympians - to make a perfect warm up that not only prepares the athlete for the work on-court but also reduces injury potential and can enhance performance (compared to a normal stretch & jog routine). Every single program consists of 13 or more exercises with details on volume & repetition plus coaching cues plus more than 400 photos for a comprehensive understanding.